When a technology shift like EV rattles an industry, usually the front-row companies like Tesla (TSLA) get plenty of attention and trade at lofty valuations. Instead of guessing who will win the EV race out of Tesla, General Motors (GM), Nissan (OTCPK:NSANY) or Toyota (TM), a good strategy is to find under-the-hood suppliers along the value chain that will prosper no matter who wins the giants war. Payton Planar (PAY.EPA – Euronext) seems like a hidden gem; an under-the-radar, boutique EV supplier that has only started to reap the benefits of the massive shift to EV, which is expected to accelerate in the coming years. “Global sales are poised to climb from 1.2 million in 2017 to 1.6 million by 2018 and further upwards to an estimated 2 million by 2019”. Investing in a car supplier, whose products are 15 times more plentiful in Electric Vehicles than ICE cars, seems like an appealing opportunity. What are Planar Transformers and what are their benefits over conventional ones? Low profile, small-scale – ideal for high power density equipment designs. Unmatched repeatability and predictability, all windings are pre-tooled which means they are ultra-reliable. Wide operating temperature range: -40°C to +130°C with unparalleled working frequency range: 50 kHz to 1MHz. The PT industry has been low-profile niche with a total market size estimated around $100-200M (due to its limited size, it isn’t covered by leading market research companies). The industry is led by specialized players like Payton Planar, Hi-Mag (which was acquired by Payton), Standex-Meder Electronics (NYSE:SXI), and Coilcraft, Inc. But in the recent years, EV and Industrial Robotics are transforming the demands for PT. EV designers need to squeeze every last ounce of efficiency from each part of the vehicle. Automotive drivetrain design engineers are embracing energy saving technology, and planar transformers are at the forefront of the revolution. Given that the battery is the #1 cost item in EV, and given the huge space toll associated with batteries, the highly efficient, low-weight, small-scale and ultra-reliable Planar Transformers are a perfect fit. So it is easy to understand why the demand for planar transformers is growing rapidly. Further, by design, the EV cars require far more complicated and demanding electricity transformation than ICE. From the conversations we had with electrical engineering executives in Tier-1 car suppliers like Valeo (OTCPK:VLEEY), Delphi (DLPH), and others, it was reinforced that EVs have 10-15 times more PT than ICE vehicles. Payton Planar was founded in 1992. The company is the leading Planar Transformers supplier (according to its own statements from its financial reports and marketing materials). It designs and manufactures (using a factory in Israel and mainly sub-contractors in China) custom-made Planar Transformers tailored to suit each customer’s needs. As noted above, its stock is traded in Euronext ($80M market cap) and its parent company, Payton Industries (PAYT:TASE) which holds 66.2% of Payton Planar (which is sole activity of the Payton Industries) is traded in Tel Aviv stock exchange (see valuations ratios for both stocks below). Here is the list of Payton’s customers. Note the prominence of car suppliers like Harman, Delphi, GM, Lear Corporation (LEA), etc. When looking at Payton’s top 3 customers, we see that the top customers’ revenues increased from 10% to 18% in 2016. Until now, the PT industry was a niche, and has been mainly composed of boutique suppliers in the size of Payton, like Standex-Meder Electronics, and Coilcraft, Inc.
As the leading PT player, Payton has been known for its superb electric design capabilities. That means that once Payton lands a design win for a car model (e.g. Nissan Leaf), it will recognize revenues along the commercial sales of the model, as well as from spare parts. In the auto industry, it generally takes 3-4 years from a design-win to cars hitting the roads en masse and another 4-5 years for a typical commercial life-span of a model. Given the nascent stage of the EV, and the proliferation of models hitting the road in 2019-20, it would seem that Payton has just begun to realize revenues from its automotive design wins. Details of those engagements are usually kept in the dark by all sides (the PT suppliers don’t want to invite unnecessary competitors and the customers’ car OEMs and their Tier-1 suppliers don’t want to disclose any details about their future models to the competitors). Usually, the company received orders ~6 months in advance, so the above backlog likely excludes Volvo (which aims to launch its EV SUV only in H2/2019) and further Nissan orders (If indeed Payton is the supplier for Volvo and Nissan, as we heard). Also, the backlog excludes any other recent EV design wins that are set to hit the road only in the next couple years (BMW? (OTCPK:BMWYY) GM?). According to Payton’s management, the current design wins are the fruits of a rigorous qualification process and tight work done with the Tier-1 automotive suppliers since 2012. If it took Payton, as the PT leader 5-6 years to penetrate the automotive industry, how long it would take to others? The automotive industry is very conservative when it comes to new suppliers. The fact Payton has already designed and supplied successfully PT to Delphi, Harman and Lear – the cream of the Tier-1 car suppliers – smoothens its penetration to other tier-1 car suppliers. It’s worth noting that Payton’s leading position makes it a possible acquisition target for the likes of Siemens (OTCPK:SIEGY), ABB (NYSE:ABB) or Vishay (NYSE:VSH). Even under a catastrophic assumption that Payton loses 10% market share of new design wins every year (meaning going from its current 25% to 15% market share by 2025), its revenues for 2018-2021 will likely be barely affected due to the time lag between previous design wins and revenues. Even assuming the above 10% market share loss, we estimate that by 2025 Payton would still generate $375M (15% X $2,500M) in revenues. Payton is cashing in on Electric Vehicle growth. Since 2016, its EBIT has grown 57%, and the backlog suggests that the best is definitely still ahead. Company stated it had already realized $5M of 31.12.17 backlog by 12.3.18 and will realize additional $20M of 12.3.2018 backlog by 2018 end. On top of this $25M backlog, we assume that Payton can generate $22M of revenues during 2018 like it did in ’16 (Conservative assumption, given the growth trajectory). 20% revenues growth from 2015 to 2017. Lean and mean operations which yield sound profit margins despite modest revenues. Backlog doubled during 2018 vs. 2017 indicating the tsunami of EV cars hitting the roads in 2018 and Q1/19 (backlogs numbers go only 1-year forward, given the EV growth rates stated above we believe it’s the tip of the iceberg for 2019 onwards). With conservative costs assumptions, based on the Mar ’18 backlogs numbers, it seems that 2018 EBIT can grow 50% over 2017. Note that 90% of the salaries costs are in NIS, which depreciated 5% against the USD since 1.1.2018. The 2018 forecast does not take that into account, and the upside could be an extra $1.5M to the annual EBIT. Payton Planar’s valuation appears very compelling at a P/E of 9x and an EV/FCF of 7x. The market cap is around 68M Euro ($80M), inferring a 2017 P/E of 14 and forward 2018 P/E of 9. Similar companies are traded at a 20x 2018 forward P/E (see POWI comparison below). 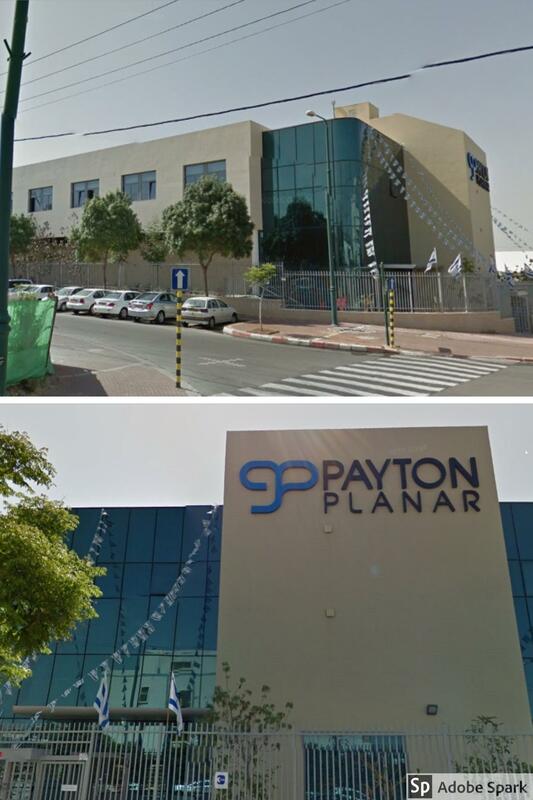 It’s worth noting that Payton Planar owns a factory not far from Tel Aviv, carried at a book value of ~$10m. Approximately $5M is attributed to the land in Ness Ziona (20 minutes by car from Tel Aviv) that was bought for $5M in 2010. Since then land and real-estate prices in that area went up 40-50%. Source: POWI – Yahoo Finance, Analysts Estimates for 2018. Payton’s EV includes just the net cash and excludes the land and the factory. The valuation looks even more appealing considering Payton’s promising secular growth, as increasing numbers of EV cars hit the road for the coming five years. 2017’s report, when discussing 2018, is far more optimistic, and focuses on the challenge to meet demand and not the demand itself. Bear in mind that every word carries legal implication, especially given the strict Israeli law that equips minor shareholders with powerful tools to sue a public company (and its controlling shareholders as well) for misleading statements. I opine that company management likely carefully considered and discussed the phrasing change. Payton pays a regular dividend, in each of the last three years it paid a ~$3M dividend (5% yield on the current price) and has +$20M available for distribution of buybacks. Sophisticated Israeli investors and hedge funds have bought Payton stock in Israel, which now trades at 30% premium compared to the Euronext stock. Payton Industries is an envelope firm, meaning all of its business is the 66.2% stake it has in Payton Planar. Payton Industries stock is traded on the Tel Aviv Stock Exchange (PAYT:TASE), and since the beginning of 2017 the stock has enjoyed massive purchases by Israeli hedge funds. They have been willing to pay up to a 30% premium above the Euronext stock due to tax and currency exposure considerations. The Bottom Line – Payton Planar appears to be a compelling investment opportunity, especially at its current price. Investing in Payton embodies the risks of a small vendor that is highly dependent on 5-10 OEMs and Tier-1 customers, as well as uncertainties regarding whether Payton will be able to maintain its position in the 5+ year time frame. Payton Planar‘s market cap includes 30% cash + ST Investments, and another 10% in land and factory. I expect EBIT to grow substantially, given doubled backlog and near-guaranteed revenues stream for the coming 3 years from the current design wins. Taking a longer-term perspective, Payton’s current valuation (mkt cap $80M, EV $56M for the Euronext stock which is traded at 30% discount compared to the Israeli one), together with the EV explosion, leaves a wide margin of safety. Payton Planar appears to be a hidden gem; we have a significant long position. I would like to thank Colibri Fund (long-short equity hedge fund, specializing in Israeli stock market) for their comments and contribution to the research. Disclosure: I am/we are long PAYTON PLANAR. Additional disclosure: The author isn’t a professional financial advisor and this article is not a substitute to a tailored professional investment consulting that adjusted to each individual’s needs and tastes.